Recently, the Hog Roast Worcester team were hired by Jon who was hosting at party at his home. He had invited a large number of people and it was essential that they all received they food at a similar time. 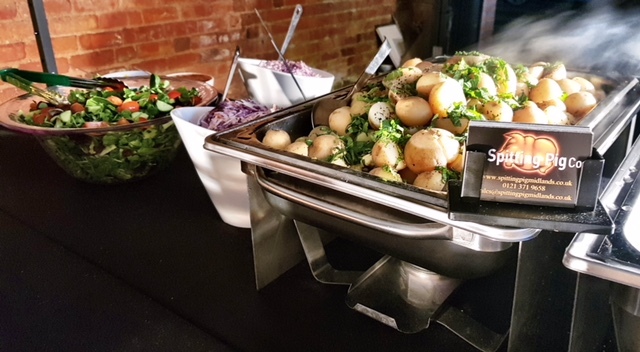 He thought that the Hog Roast team would be perfect for his event as they could provide a buffet which could cater for a large number of people at once and ensure that there was plenty to go around. In addition, with their equipment they had the ability to keep the food warm so the guests could return to it throughout the evening. It also allowed Jon to enjoy the party and not have to worry about catering at the team had it covered. Jon selected Menu Three from those offered by the Hog Roast Worcester team. This consisted of a spit roast for the majority of his guests which involved cooking the hog more traditionally on a spit pole using the rotational method to ensure that the hog is evenly cooked. Usually the Hog Roast team roast the hog in a tray, however the more traditional method is used upon request. The spit roasting method also creates a great atmosphere, especially if your hosting a large party as brings theatre to the event and provides a brilliant centrepiece for the buffet spread. The hog meat is always served with the classic sides of apple sauce, crispy crackling and homemade stuffing. Alongside the hog meat, a vegetarian option of vegetable skewers was included in the buffet. The service was led by the Hog Roast Worcester team’s very own Head Chef, Greg, who oversaw the cooking of the buffet and the spit roasting of the hog. Jon requested for the buffet to be served at 8pm and Greg ensured that the team did not miss the deadline. In addition, Jon also requested for the Hog Roast team’s speciality sauces to be served alongside the meats which included the Jack Daniel’s BBQ sauce, hot chilli sauce and sweet chilli sauce. All of the guests appeared to really enjoy the food and no one found a fault with the buffet. Hog Roast Redditch for a Local Dog Show! Dietary Requirements? Let Hog Roast Studley Take Care of Them!